I walked over and found a gap to peer through… 3-D printing. I easily get mesmerised watching these printers build layer upon layer with a beautiful take on monotony… but 3-D printing is nothing new. In fact, many 3-D printing companies in the US have already lost interest or gone bust, so I thought these excited people simply didn’t get out enough. 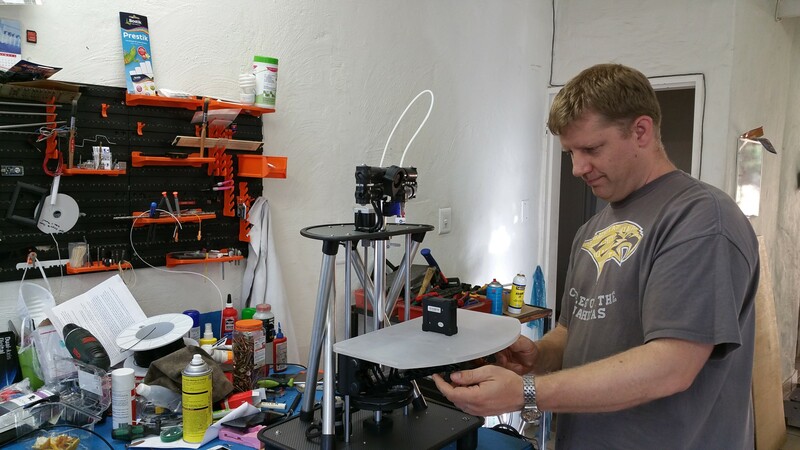 ‘He built it himself’ one lady told her son and I immediately had to take a second look… The 3-D printer was different from the usual kind of printers you find in the Stuff sections of tech magazines and websites. It wasn’t the typical enclosed cube… in fact it was open, bigger and simply clever. I tried to look for a gap to speak to the mastermind but he was surrounded by wide-eyed people who wanted to lap up some of the inspiration and brilliance that the man behind the display table exuded. I took a pamphlet, saw the name Quentin Harley and made a note to catch up with him later. Jumping to later – I tracked Quentin down in his workshop, situated behind the iconic maker’s clubhouse, House4Hack in Centurion, and asked him some questions. Quentin is the owner of Morgan 3D Printers and his business attire is a T-shirt. He patiently answered my questions, going about his work, fiddling with the digital insides of a 3-D printer. Quentin seemed laid back but I knew that what I was witnessing was a calm confidence of a master at work and a quiet focus on the job at hand. Me: Quentin, what is the premise of a 3-D printer? I mean, why bother? Q: People are creative beings and we always have ideas and things we want to make. I think Terry Pratchett described this idea well in his take on dwarfs in the Discworld fantasy series. He wrote that a dwarf only needs an axe and a way to make fire, to make things. With the fire and the axe he is able to make simple tools. With the simple tools he able to make complicated tools, and the with complicated tools he is able to make practically anything. So people, like dwarfs, love making things and people love making things with which enable us to make things. A 3-D printer is a tool we made to help us make many different things… Like a very complicated hammer. The great thing about a 3-D printer is that it democratises the making process. It eliminates the skills barrier. You do not need years of specific training and experience, with a wide variety of tools, to make something unique. Me: Where did 3-D printing start? Q: 3-D printing, as we know it today, is based on what we call FDM or Fused Deposition Modelling. It all started about 25 years ago with a company called Stratasys, when founder Scott Crump invented the process. … but design students in the sixties laid the foundation for this type of printing. They used to cut of pieces of paper and layer it one on top of another to make sculptures. This was time consuming and labour intensive but a 3-D printer makes this process a cakewalk. So that’s where it started. They didn’t call it printing back then… printing is a bit of a misnomer… It was called printing because that is what people are used to… you know, when you plug a printer into your computer and send a file for printing… so that name stuck because it is a similar concept. It is actually a CNC additive manufacturing machine. A normal CNC milling machine will cut away layer for layer but instead of taking away bit by bit from a big block of something – with a lot of discarded material – this process starts with nothing but an idea and adds layer for layer until you have what you designed… and there is virtually no waste. Me: Quentin, I believe in a community-first approach to business. What opportunities can 3-D printing create in our community? Q: The opportunities are basically only limited by imagination and depends on the interests and background of the particular maker. For instance, two people will look at a 3-D printer and one will make tools for his garage, clips for his car and perhaps a toy for a child. The second person would use it for jewellery design, ornaments or a replacement heel for an expensive Jimmy Choo shoe. There is a South African designer who prototyped a new mask for a blast suit used by bomb squads. The company is based in Germiston and they sell worldwide. 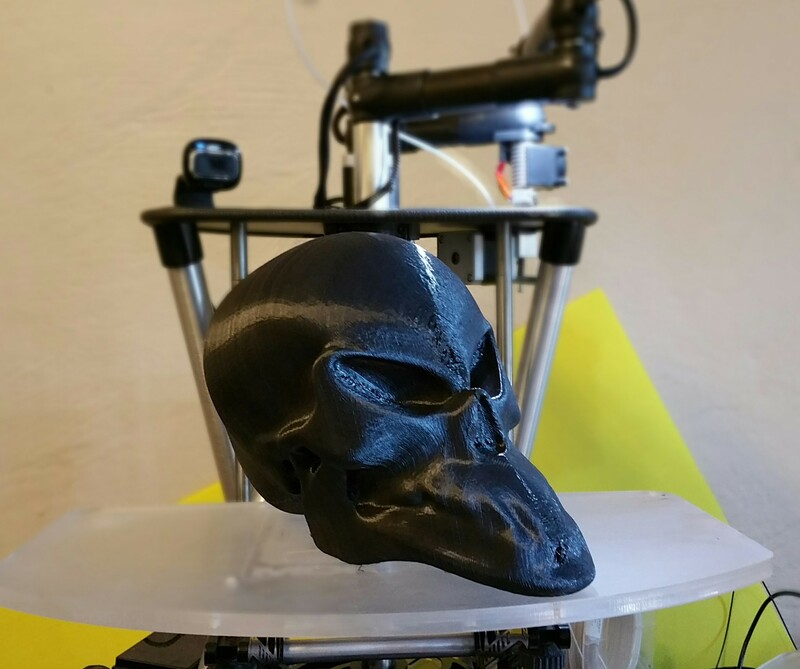 One of my clients started off a while ago as a 3-D printing enthusiast but now has a roaring trade making spare parts for people in the Centurion drone and quad-copter circles. You can go as big or small as you want to. Me: That leads to my next question, who should buy a 3-D printer? Q: Anybody with a good idea. I would like to say creative people but most of us have been brainwashed to think that we are not creative. Anybody who has the desire to make something should consider 3-D printing. If you see something you want but would rather make it, then 3-D printing is for you. If you want something but no one else has made it, then 3-D printing is for you… And you grow with each job. I have become much better at it over time and eventually your 3-D printer becomes part of your tool chain. I started off with a 3-D printer but now I have many more tools to take my designs even further. So if you want make things but don’t want to struggle making it, get a 3-D printer. Me: Quentin why did you design and make a 3-D printer? Q: I was an engineer at a company where I maintained and installed medical imaging equipment. I kept myself busy on the side with own projects and couldn’t find anybody to print the things I needed, so I decided to build a 3-D printer and that is how it all started. A lot of people were interested and soon I started helping them build their own 3-D printers. I had my own design – and it is quite distinct – and after blogging about it I got quite a bit of attention from international media and people wanting my machine. I kind of entered a competition by default and won first prize in the Uplift Prize for Interim Personal Manufacturing, 2013. The $20 000 prize money helped towards setting up my business. My 3-D printer has also won me 3rd place at GAP ICT in 2014. Me: OK, so we have covered the history and uses of 3-D printing, tell me more about your printers… Why should I buy a Morgan instead of one of the imports I see in the tech magazines? Q: We make it super easy for beginners. Our printers are simple, effective and easy to work with. A license for Simplify3D, which is an all-in-one 3-D printing software package, is included in the purchase price, making you print like a pro from the word go. Apart from the lightweight materials and the precision design we believe in out-of-the box printing. That simply means that we don’t have the needless casing around our printing area. This enables bigger print dimensions than other machines with similar footprints and price points. We have two models; the Pro and the Mega. One of my clients runs a full time car bumper printing business on his Mega and our printers handle full-time production environments as well as they do the occasional job for a hobbyist. Morgan printers sport an extremely low maintenance design, with high dust tolerance – they are perfectly suited to African conditions. We have a one-year walk-in warranty for personal use, back-up batteries for uninterrupted printing and we are priced very competitively …and we are a proudly South African company operating from the heart of Centurion. Me: OK… but you had me at hello already, just take my money. For a good discount, quote #MORGANPROMO1JUN when you buy a Morgan Printer… and you know you need to buy one.